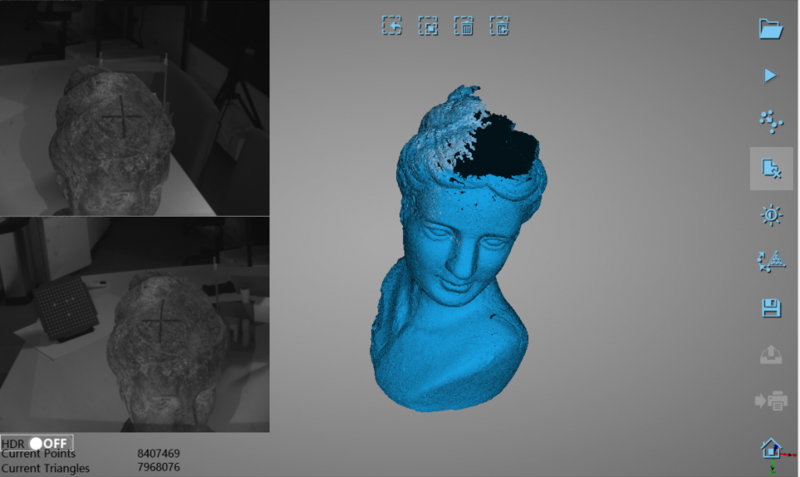 Little over month ago I wrote a preview post about the EinScan-SE & SP desktop 3D scanners, after attending the launch event in Shining 3D’s new office in Stuttgart, Germany. Now — after a few weeks of testing both devices — it’s not only time for a full in-depth, hands-on Review, but also a comparison between the two. I wanted to test them at the same time because there’s quite a price difference between the $1199 SE (E standing for Elite) and the $2299 SP (Platinum). So after reading this post you’ll know exactly what you get more for $1100. You’ll also know if you get less when buying one of the EinScan desktop scanners instead of a HP Structured Light Scanner Pro S3 (a.k.a. DAVID SLS-3) that I reviewed recently, which costs about $6950 for the complete kit with two cameras and a turntable. And of course, I’ll also go into the difference between the EinScan-SP and the EinScan-Pro (Review), that now look like brothers but are still $3300 apart if you want the latter to also have both an electric turntable and a color scanning module. The EinScan-SE (pictured, right) and SP (left) look very similar. The SE comes in matte black which makes it follow the aesthetics of the S and the SP has glossy silver elements, which makes it look like a small EinScan-Pro. And while the P officially stands for Platinum, SP could just as well stand for Small Pro. I personally like the matte black color better. That is subjective and largely influenced by the fact that I’m a Batman fan (read about how 3D Scanning was used to create VFX for the Gotham TV series here) and all my other computer peripherals are black. Opinions aside, both the SP and SE have a small enough footprint and look good enough to have a permanent place on your desk — especially compared to the original S. And now you have only one USB cable (compatible with 2.0 and 3.0) and one power cord running across your work space and you accidentally moving the scanner head — which the S would do if you breathed to hard — is almost impossible now. That’s both true when the head is in the stand or on a tripod. Which, by the way, is included with the SP but not with the SE. Luckily, both scanners now have a standard tripod thread so you can use any tripod you have for added flexibility. And as you’ll see later, you are going to need a tripod to scan most objects. I used a $80 Manfrotto Action Tripod which I personally find a bit easier to use (quicker to adjust and easier quick-release) than the tripod that came with the SP. That said, the included tripod (pictured below) is portable and sturdy. As a last note about the new design, I found it a bit awkward that when the scanner heads are in the attached mounts they seem to be tilted a bit to much upwards. 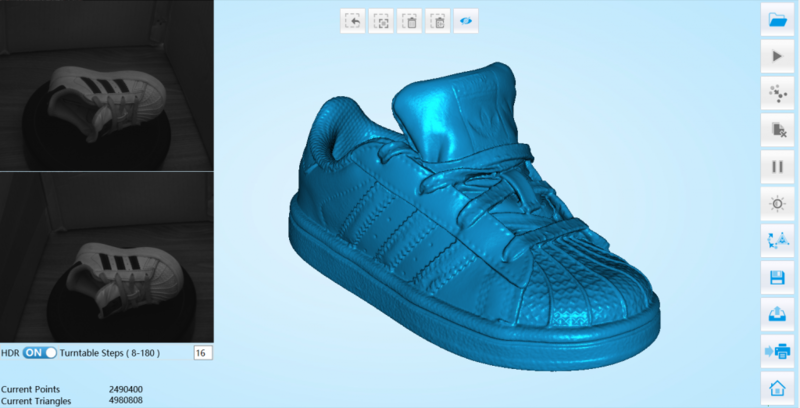 This allows you to scan slightly larger objects but doesn’t scan all the way to the turntable. I actually put most models on a 1cm stack of Post-its to elevate them a bit. The EinScan software has improved a lot since my review of the original S. I’m going to be completely honest here: it look better but it still won’t win any UI-design awards. But it’s functional and a lot more stable, which might be the most important part. The interface does change depending on if you’re using the SE (light blue with dinosaurs) or SP (grey with stylized icons) so it’s clear what target audience Shining 3D has in mind for the two models. What I dislike about the software is that it’s basically a collection of completely separate programs made to look like a single one. And every separate program loads very slow. Not only are the Fixed Scan mode, the Auto Scan mode (with the electric turntable) and scanning with or without textures in both modes, are completely separate. You also have to leave either of them if you discover you have to recalibrate the scanner. The same is true if you discover the colors aren’t captured correctly. You’ll have to go back to the “main menu” and reload the scanning mode because that’s the only time it asks if you want to calibrate the white balance. The in-between loading can take minutes, even on a 6th generation i5 processor with 32GB of RAM. In my opinion it would be a real improvement if I could just toggle between fixed and automatic scanning, textured or color-less scanning and perform the calibrations without leaving my project. On the upside, the software is pretty stable. 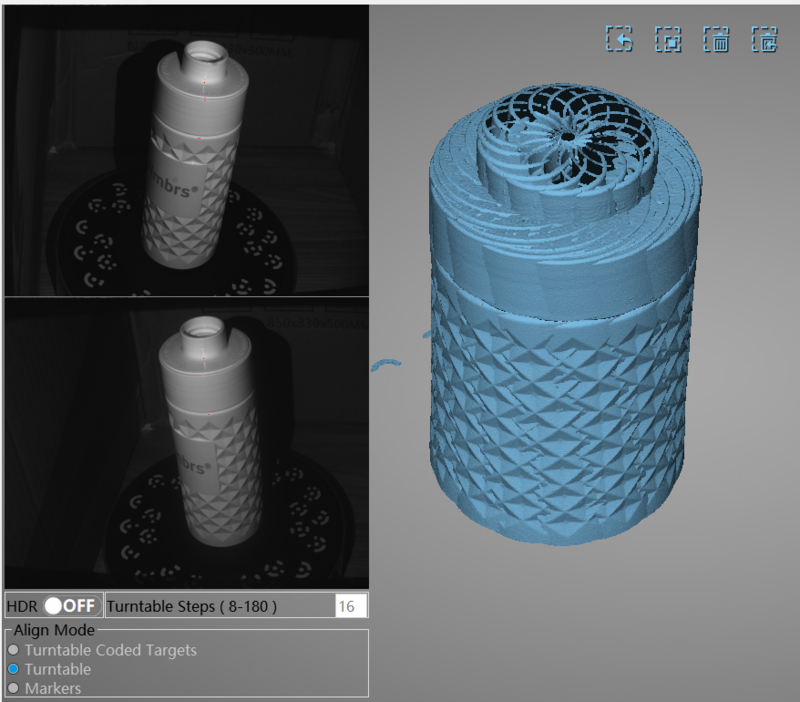 I only encountered crashes — as in complete system freezes — when I chose to process the scan data as a watertight mesh at the highest quality setting. The crashes were always at 85% but it only happened with a few objects. Otherwise the processing cycles of the software are fast — a sheer contrast with the startup times. What’s especially fast — and good — is the registration algorithm. Whether it’s a complete 360-degrees cycle in Auto Mode (which the software sees as a single scan) or a separate scan in Fixed mode, I encountered almost no problems with registration and it was all done in seconds. And in the rare case of a forgivable registration mismatch it’s pretty easy to help the algorithm by manually selecting 3 points on both scans. You can see this in the example below where I took two scans of a bottle — one facing up and one facing down with the scanner head in the same position. The automatic registration made both the top and bottom facing upwards, but after selecting these 3 points (It took me a moment to discover you have to SHIFT + click in the two small viewports to place points) alignment was fixed in a blink of an eye. What also has improved is setting the brightness. An over-exposure indicator now helps you find the best setting. According to the product website the SE requires an Nvdia graphics card with 1GB of VRAM or more and the SP requires a Nvdia GTX 660 or higher with at least 2GB. My test PC has a brand new GTX 1070 with 8GB of VRAM. It’s also good to know that the SE required 8GB of regular system RAM and the SP 16GB. My test system has 32GB. Of course there are more differences to be expected on the SP for almost twice the price. One thing you might not notice on product photos is that the SE comes with a calibration board made from foam board and the one that comes with the SP is made from heavy duty material, I’m guessing ceramic or something. It comes in a protective pouch and feels a lot more pro. It probably won’t matter for calibration but I’m sure the foam board one will not last for years. It’s also more prone to fingerprints and harder to clean. While the board is now bigger and the stand (which is the same on both models) is studier than the original S I still don’t like the calibration method on the EinScan-S series. It still requires you to rotate the board in 3 positions and the calibration process still has no smartness built in to let you know you’re doing it right. You can put a potato on the turntable and it would still continue to the next steps, only to let you know “calibration has failed” when crunching the numbers at the end — which takes surprisingly long. 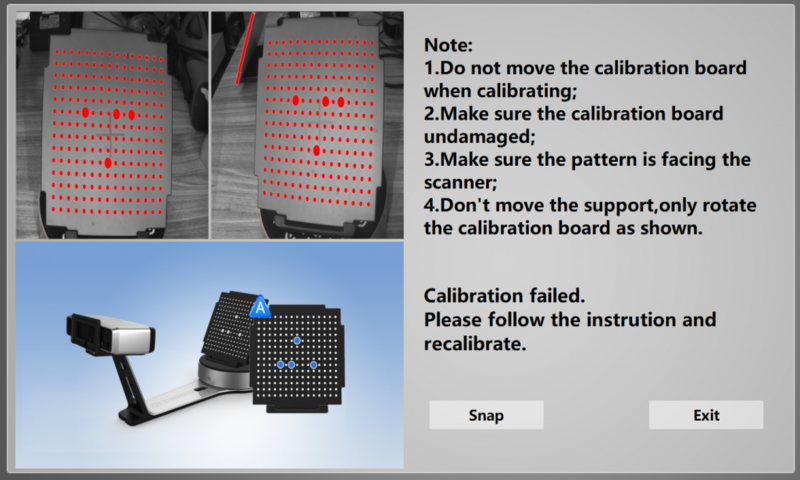 At first I had a lot of failed calibrations and couldn’t figure out why. I took me a while to realize that it had to do with the fact that my office is nicely bright lit and it’s almost summer. Structured Light Scanners don’t like other light in general but the SE and SP basically hate light. Even in a dim-lit room, the geometry would capture but the color wouldn’t. For optimal results, these scanners should be operated in complete darkness. For this Review I took all scans in complete darkness (unless noted otherwise) and for this I simply used the large cardboard shipping box my two scanners (which themselves come in beautiful boxes) were delivered in. Another aesthetic difference is the turntable. The one that comes with the SP has 12-bit coded targets printed on it, similar to the ones I used when reviewing the Agisoft PhotoScan photogrammetry software. So yes, they can make a difference but there is a catch. I discovered that this feature only works on a tripod and at a relatively steep down-facing angle like you see in the camera viewports above. With a straighter angles the recognition became less robust, sometimes missing a few scans entirely (without giving any error messages). And of course this is also an ideal object because it’s a cilinder that fits nicely on the turntable and doesn’t obscure any targets. Wider objects can easily do that. I think the result is great. 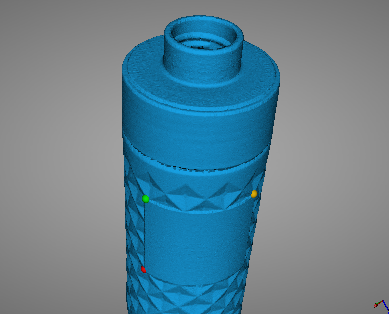 The little surface noise it has can easily be removed by smoothing and/or decimating and I’m confident that it would be a great basis for a CAD project. The SP comes with a big pack of marker stickers that you can put on objects to make scanning easier. 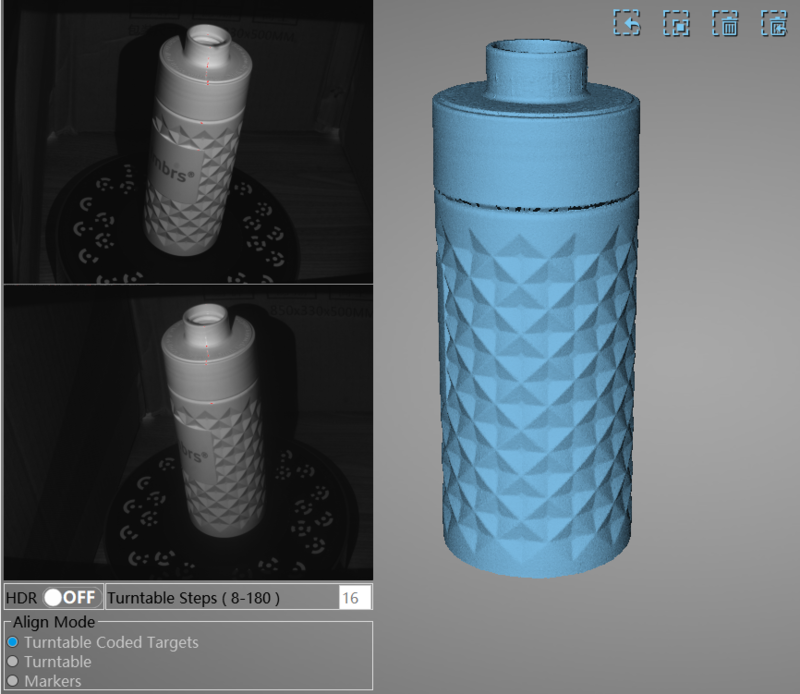 I didn’t test them since none of my test objects require them but they will probably come in handy for scanning technical objects with a lot of symmetry or very little surface detail. Maybe the biggest difference between the SE & SP for everyday use is the speed. The SP is twice as fast as the SE. A single scan takes just 4 seconds and a complete 360° automatic scan is completed in 1 minute — 3 times faster than the original EinScan-S! However, keep in mind that that last number is based on 8 scans for a cycle. This works on very simple objects, but I would generally advice to set it to 16. I performed all tests with this number and felt no need to go higher. So that would mean 2 minutes on the SP and 4 on the SE. And if you want to capture color it takes almost twice as long. The scan size of the SE is about the same as the original S: 20x20x20 cm for an automatic turntable scan and 70x70x70 cm for a fixed, manual scan. For the SP the latter is 120x120x120 cm. I haven’t tested if this is a hard software cap but I guess it has more to do with the fact that the SP requires 16GB of RAM instead of 8GB. The whole process worked very well. I used the SP and did 3 cycles at different heights, starting with one at face level with about 10 scans Then I did the lower section with about 8 scans followed by the top section with another 8 steps. Again I discovered that the registration algorithm is good and fast — it always placed the piece in exactly the right position within seconds. The last-added part is highlighted and it’s clear which parts are still missing. The result from the EinScan-SP is very similar to that of the SLS-3 in terms of geometric details — it’s actually more detailed. But before jumping to conclusions it must be noted that I processed the SLS-3 result at the default “1500” quality setting because anything higher (the highest is 4000) would either take extremely long or lock up the system I was using for that review (which was the first gen HP Sprout (Review) with just 8GB of RAM which simply isn’t enough for stuff like this). I already went into this a bit in the section above but I wanted to do the actual comparison with some smaller objects because I think that’s what most people will be scanning with the SE and SP. Click to enlarge. If you want to skip the lightbox and see it at 100% scale: right-click and open image in new tab or window. Based on this comparison — and those from other scans I made with all these scanners — I’d say that the SE is probably a small step up from the S in terms of scan quality, but not huge. But I don’t find the difference in scan quality between the SE and the SP significant. Surely not double the quality in any of my tests. And again, I scanned in complete darkness and calibrated a lot following the calibration instructions closely. You only get these quality options with Watertight Processing. Also, while watertight processing on High delivers more than three times the polycount, it also takes at least three times longer and made my system unstable on some occasions. And while there are some differences if you look very closely, I wouldn’t call them significant and not worth the extra time and resources. The rubber nose and sole of the sneaker the show much crisper details and structure. Also the SLS-3 was able to capture the stichting in a better way. There’s even some texture on the laces. The SP did capture the black stripes on the side better (just the sides though, the middle part is a fill), but I didn’t test the SLS-3 in complete darkness like the SP so I’m not going to claim the SLS-3 isn’t be able to capture that black part at all. All things considered, I’m actually very excited by the geometric quality of both the Einscan-SE and SP. I would like to say that it’s the best in this price range but a bit easy to say because there really aren’t any other structured light desktop scanners in the $1000-$2500 range. I think it’s best to say that for this price it’s almost impossible to be disappointed about the geometry quality. The problem with the color is that, like the original S, the SE and SP only have two monochrome cameras. The scanner captures color by projecting red, green and blue frames onto the subject and rebuilding the the colors in an inverted way. The problem with this method is that the color green is a lot brighter when projected than red and certainly blue. I’d say the texture is actually very usable for many purposes and for me it was completely worth putting the scanner in a cardboard box — kind of a mini film development dark room. Here’s another Auto Scan with the turntable from a Tripod. I scanned this Old Jar two times with 16 scans per cycle: first facing up, then facing down. 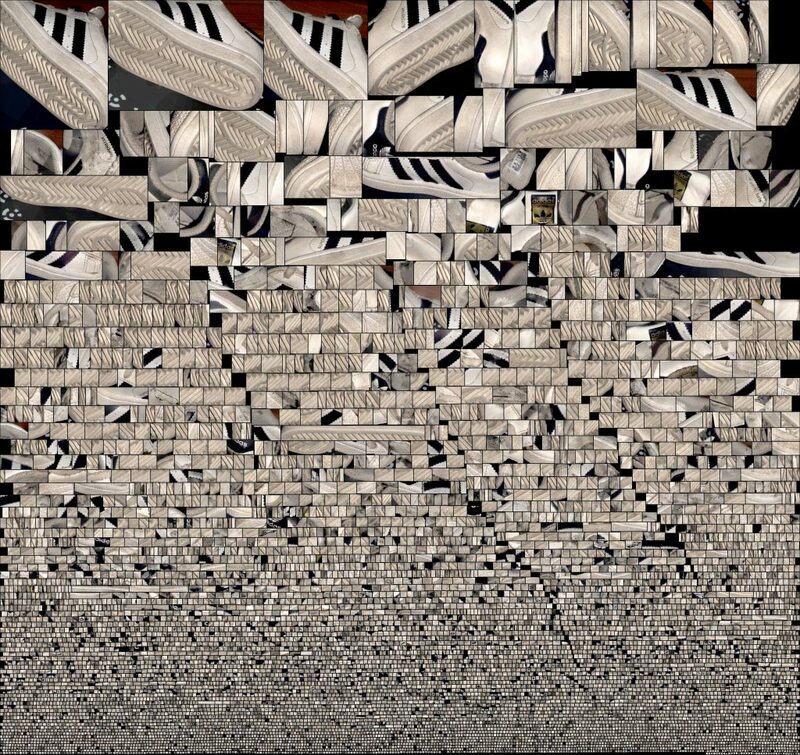 The software automatically fused the two scans together correctly. 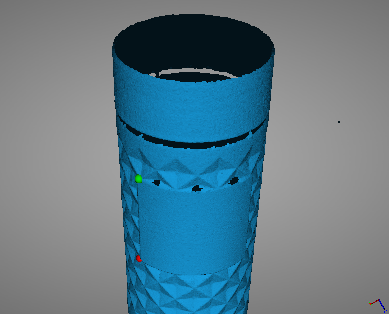 I used the Unwatertight meshing option here, which somehow doesn’t offer any following quality options and is also the fastest meshing option. 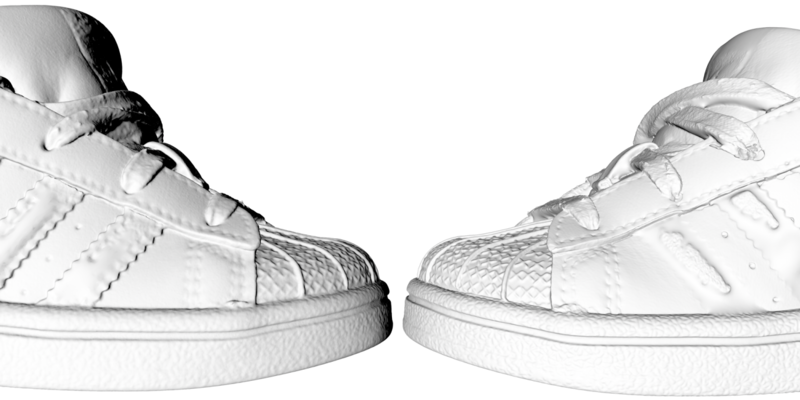 This combination of doing two auto scans, meshing them unwatertight, exporting to OBJ, uploading to Sketchfab and tone mapping it there is a very fast way of getting a detailed quality scan with decent texture from an object. Before I go into exporting and sharing, it’s good to know that there is no Save function to save projects in the software. You basically give your project a name when starting a new project and the software will create a small reference. Then it will simply create a depth file and a a color file for each separate scan and put it in the same folder. This isn’t necessarily a problem, since you don’t have to think about saving — every scan is always saved. 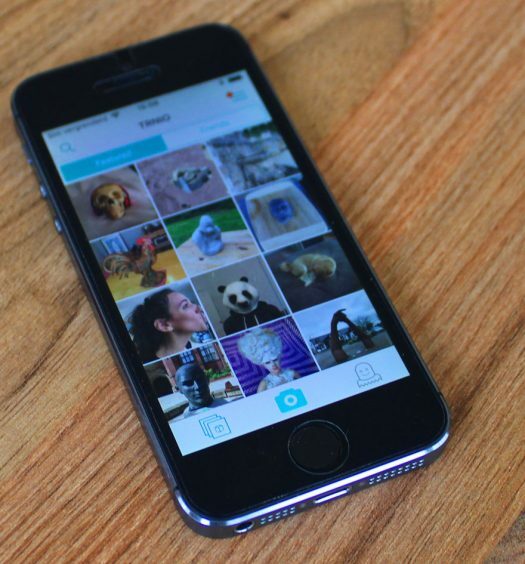 It’s just a good idea to save each project in a subfolder to keep things organized. 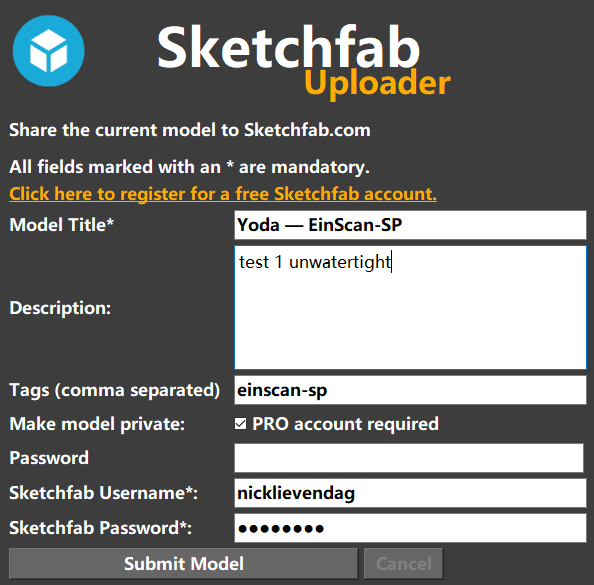 There’s also a button to share your scan directly online through Sketchfab — but it’s a bit too basic. For starters, it doesn’t remember your login credentials. It also doesn’t include textures on export which is why I didn’t use the sharing feature. To finish this review I made a scan with the EinScan-SP (second embed) of the 3D printed Yoda bust I also scanned with the original EinScan-S (first embed). In both cased I did an Auto Scan with the scanner heads mounted in the default position (no tripods). I didn’t use the color for this comparison but both models are processed at the highest quality the software could generate. What strikes me is how different these scans are. The Einscan-S scan (first) has 9M polygons and the SP scan (second) has 15.5M polys but the former seems to contain more detail but it’s also noisier. The latter is smoother and if you look closely you can even see that it captured the 3D printing layers. 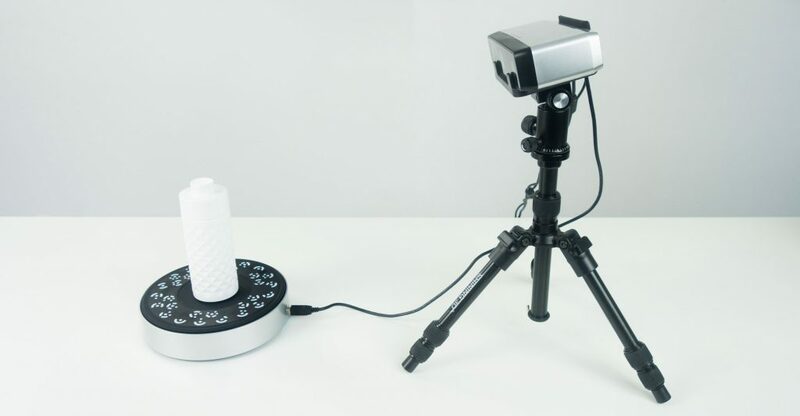 With the original EinScan-S, Shining 3D disrupted the desktop 3D scanning market by introducing a device that is affordable for many and delivered surprisingly detailed scans. The drawback was that the device wasn’t particularly easy to setup and use. With the EinScan-SE all these issues have been fixed while keeping the price at $1199 — the same as it predecessor originally was. The original S is still available for $999 but I’d advice anyone to spend the extra two hundred bucks and get the SE. Keep in mind that these prices include the turntable, which is often a separate purchase a with other brands. If you want to scan mainly small (and occasionally medium-sized) objects, you won’t be disappointed. Bottom line, the S was already a good scanner for the price and the SE is better in almost every way and costs about as much. If you want to scan mainly small (and occasionally medium-sized) objects, you won’t be disappointed. The EinScan-SE delivers a quality that’s miles ahead of depth sensors like the Sense 2 (Review) and Structure Sensor (Review) and with more ease and speed than Photogrammetry. At $2299 Shining 3D is trying to bridge the price gap between the SE and the EinScan-Pro (Review) and Pro+. The scanner has similar looks and adds (sofware) features like detecting the Coded Targets on the turntable and (supplied) Marker Stickers. 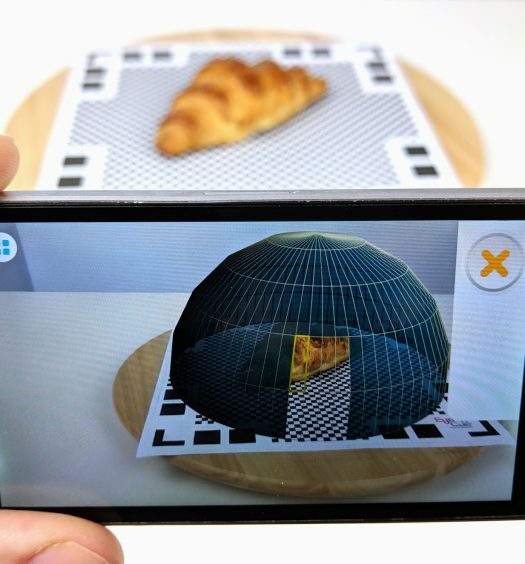 If you really need these two features depends on the objects you want to scan. For flat-surfaced, generically shaped engineering subjects they might prove handy but the software’s registration algorithms are so good that I didn’t need them at all. And the Coded Targets really only work with very small objects that don’t occlude them. The speed alone might be worth the extra $1100 for professionals. While the higher price might put off hobbyists and educators, the ~$2K range is still affordable for small businesses. And even if you don’t really need the targets, markers (or higher quality if there really is any for objects other than mine) the speed alone might be worth the extra $1100 for professionals. And while the tripod might not be a system seller, the more durable calibration board might be. So that’s it, my opinion about the new scanners from Shining3D. The only EinScan scanner I haven’t tested yet is the Pro+ but I’ll ensure you I’ll give it a spin later this year. First up are the Orbbecc Astra S depth sensor and a $89 smartphone 3D scanning gadget called Bevel. Follow me on your favorite social network if you want to know when these Review are up. This post has been updated after publishing to better reflect the difference in accuracy between the SP and the SE. I can see you’re mostly into organic shapes, and textures.. Could you show a scan of something more geometric, for example I’d like to scan my wireless thermostat, which is mostly a box, and slightly reflective. The Juice Box and Bottle examples are non-organic, geometric shapes. Both are also slightly reflective surfaces. Oops, good point that, nice and sharp. I guess (switching the juice box to matcap and rotating), the bottom isnt flat because you didnt rotate that one? The jar is impressively merged.. Thanks for making clear what the differences are! Thank you for all great reviews you done on our website. 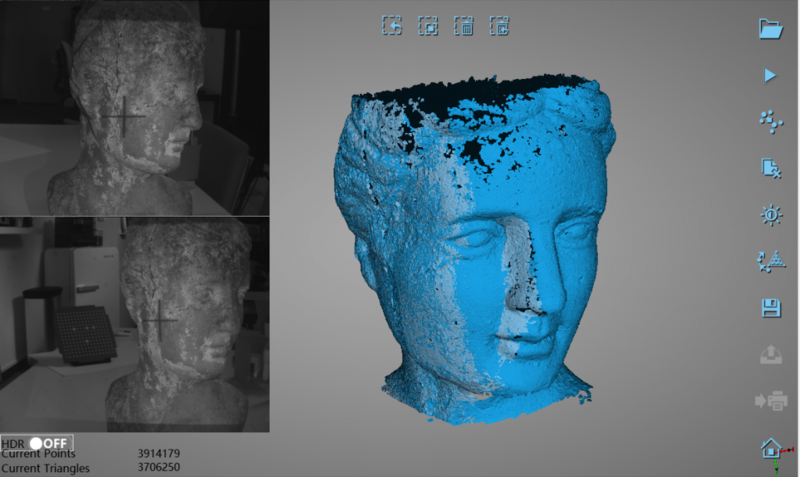 I wonder what do you think (based on your big experience with 3D scanners) if SE and SP scanners are suitable for scanning detailed and precise small objects like dental models? for this SP, based on your experience, can we use it to scan people body or head? Dear Nick, has Einscan SE this Ability to use target points(marker stickers) for large size scanning?! If you want to scan bigger objects (full body scan), is it possible with this scanner? No for that you need a handheld scanner like the EinScan-Pro, Pro+ or Artec Eva. I have had this scanner for weeks and still can’t get it to work…. 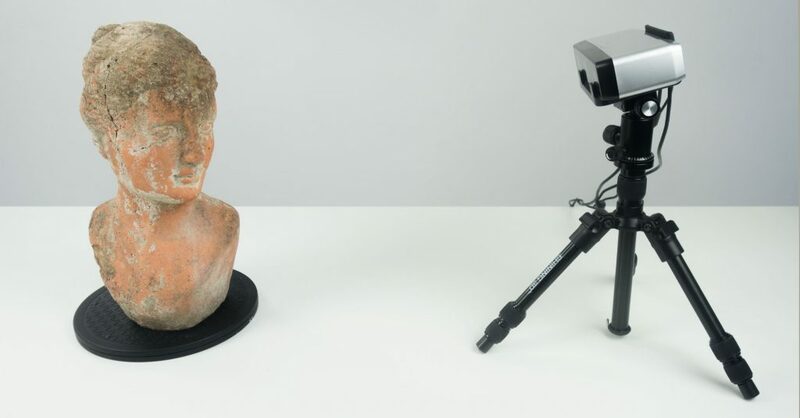 maybe test scanning a 24″ tall by 10″ wide marble statue or something moving the scanner itself around the object rather than a turntable in “fixed” mode? ?